Each of the Earth’s minerals has a crystalline form. Diamonds are crystalline carbon; emeralds are crystalline beryllium; and rubies are crystalline corundum. The difference between corundum and a ruby is the way the molecules are organised or structured. Each crystal has a specific structural pattern. Minerals form crystals when circumstances (for example: heat and/or pressure) cause the molecules to form a repeating pattern. Most people know that extreme pressure is required to form a diamond. Pressure forces molecules to arrange themselves in a different configuration to withstand the pressure. Structural organization changes the characteristics of the substance. Some of these changes are obvious—like the visible difference between carbon and a diamond. It’s all a matter of organization. Healthy DNA is surrounded by structured water. This water is responsible for the DNA’s stability. Structured water is also responsible for supporting the magnetic field surrounding DNA. As water loses its crystalline structure (because of age and disease), the integrity of the DNA is often compromised. Youthful DNA, surrounded by crystalline/structured water, has a much stronger magnetic field than DNA from older individuals. Top row (above) The tetrahedral molecular structure of water as viewed from the side. Bottom row (above) The hexagonal pattern as viewed from the top. Quartz crystals exhibit the same molecular geometry as structured water. 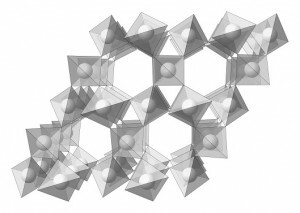 Quartz is a network of interconnected SiO4 tetrahedra. Structured water is a network of OH4 tetrahedra. This is one reason water has the capacity to store and transfer information. The image to the right shows the geometric pattern in quartz. It identifies the tetrahedral arrangement as well as the hexagonal channels created by the repeating geometry. Water can form many structural patterns depending on its vibrational environment. When there is a high degree of hydrogen bonding (no matter the pattern) then water behaves differently and takes on different characteristics. Water’s capacity to store and to transmit information is directly proportional to structure and coherence. 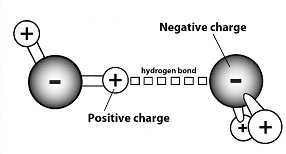 The greater the structure (characterized by increased hydrogen bonding), and the greater the coherence (characterized by the degree to which the water can maintain its structure), the greater its capacity to store and deliver signals and other information.